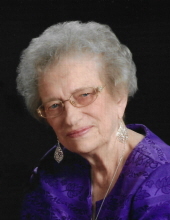 Kathryn L. “Durheim” Harman, 84, of Perry, went home to be with her Lord and Savior on November 18, 2018, at Perry Memorial Hospital. A celebration of her life will be held on Friday, November 23, 2018, at 1:00 p.m. at the Christ Lutheran Church of Perry with Rev. William Metz officiating. She will be laid to rest in Ponca City at Resthaven Memorial Park. Viewing will be held on Wednesday, November 21, 2018, from 8:00 a.m. to 8:00 p.m.
Kathryn was born on November 10, 1934, to Charles Alfred and Katherine Susanna Durheim on the farm just NE of Covington, OK. She was the youngest of seven children and graduated from Covington High School in 1952, and then went on and attended Enid Business School. On July 6, 1953, she married George Calvin Harman at St. Paul Lutheran Church in Enid, OK.
She had many great things about her that will be truly missed by her family and those that were touched by her love for cooking homemade bread, chicken and noodles, cinnamon rolls, and peanut brittle. Family and others in the community would receive her candy and baked goods that she loved to share. She enjoyed doing needlepoint, crocheting, plastic craft and quilting. Kathryn loved watching Thunder Basketball, OU Football, and Dallas Cowboys Football and showing her team spirit by wearing jewelry of their colors. She also enjoyed fishing and playing canasta and pitch. She is survived by her husband of the home; three children: James (Hat) and wife Janell Harman, Donnie Harman and Dale Harman; two grandchildren: Cody and wife Stephany Harman, Heath and wife Nikki Harman; and three great-grandchildren: Chase Harman, Brady Harman, and Kaitlyn Harman. Kathryn is preceded in death by her parents; four brothers: Carl Durheim, Arthur Durheim, Louie Durheim, and Clarence Durheim; and two sisters: Freda Durheim Reim and Mildred Durheim Bernard. Memorial contributions may be made to Christ Lutheran Church in care of Trout Funeral Home of Perry, 1408 N. 7th Street, Perry, OK 73077. The family would like for you to leave your condolences and memories of Kathryn at www.troutperry.com. To send flowers or a remembrance gift to the family of Kathryn L. Harman, please visit our Tribute Store. "Email Address" would like to share the life celebration of Kathryn L. Harman. Click on the "link" to go to share a favorite memory or leave a condolence message for the family.